To start following this guide you need to download and install Ubiqua on your computer. 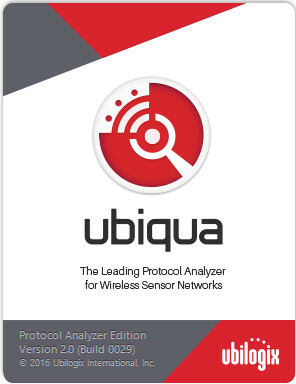 To download the latest version please visit the website at: http://www.ubilogix.com/ubiqua. The website will ask you to sign in using your Ubilogix account. Remember to read the End User License Agreement before using Ubiqua and its related services. If you don't have an account you can create one at: http://www.ubilogix.com/register. The registration is free and it will take you no more than a couple of minutes. Ubiqua requires the following resources to work properly in your system. Make sure your system meets the minimum requirements before you install the software. Windows 7, Windows 8.1, Windows 10 or later. Microsoft .NET Framework 4.6.1 Available as a free download at: https://www.microsoft.com/en-us/download/details.aspx?id=49981. Windows XP users have the option to install Ubiqua from the 1.3 version (build 2142) until the 1.5 version, Microsoft .NET Framework 4.0 is required. 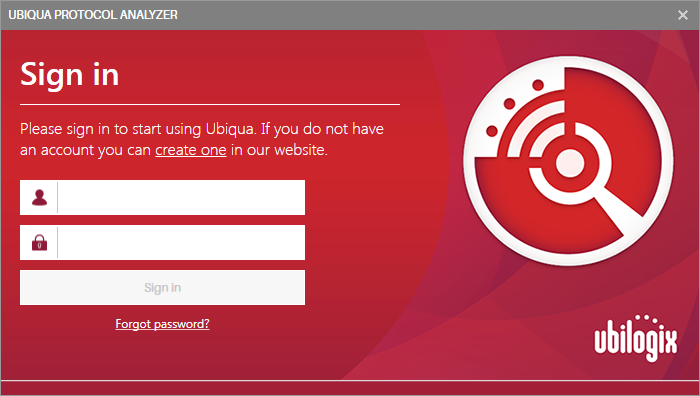 After downloading the Ubiqua Installer, navigate to the location where it was saved and double-click on it. The installation process will begin with the Setup Wizard window. Click on the Next button and then read the End-User License Agreement. You need to agree to the License Agreement by clicking the "I accept the terms in the License Agreement" check box in order to continue with the installation. 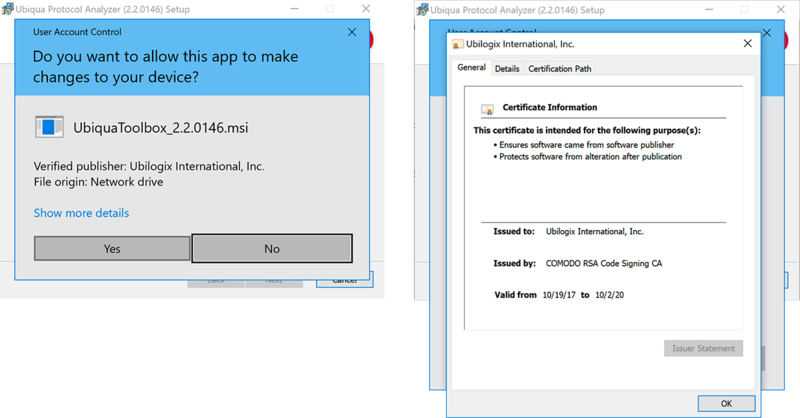 Following this action a ‘User Control Dialog’ will appear asking you to accept the changes on your device, in this window you will find details about the Ubilogix certificate, click on the ‘Show more details’ link to expand the information about this. Next you have to choose a location on your hard disk drive where Ubiqua will be installed. By default it will create a folder named "Ubilogix" and a subfolder "Ubiqua Protocol Analyzer" within the Program Files folder and place all needed files for the software to operate in there. We recommend you don't change the default destination folder unless you have a better option that suits your needs. To continue installing Ubiqua, click on the Next button. Now the wizard is ready to copy all the files. Click on the Install button. Depending on your user credentials the installer might ask you for permission to make changes, in such case please follow the instructions on screen. The installation process should not take more than a few seconds. 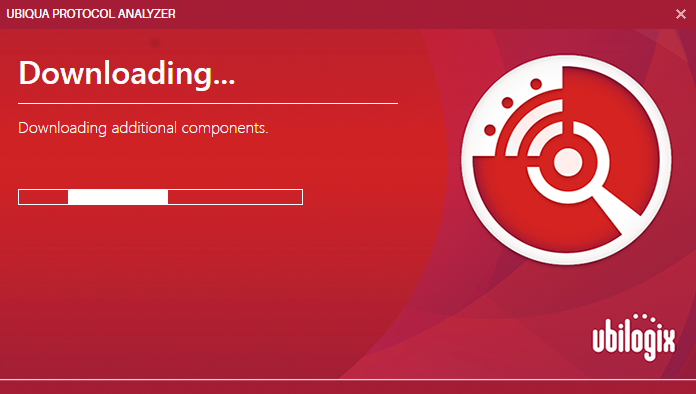 On the final screen you will be informed that the installation process is completed, click the Finish button to close the setup wizard window. Congratulations, you now have Ubiqua installed on your system! To activate your free 21/days evaluation you need a Ubilogix account; if you don't have it, go to the Ubilogix website and from the top menu go to the "Products" option, select the "Evaluation" link and follow the instructions, if you decide to buy a license select the “Purchase” link, then click the “Create a subscription” button and configure your plan, for more details about our licensing methods you can read about it our FAQ Section. You should get your evaluation access code by email within a few minutes. To be able to use the evaluation you have to activate the access code; for this just follow the instructions in "Validating an access code" section. Please note that only one evaluation-license is provided per user account. The evaluation version of Ubiqua is the fully functional version, but with a 1000 packets limit when capturing, or opening capture files. Once the evaluation period ends, the Welcome window will only show the options to upgrade or purchase a license. Click the Sign in button, by default you will be presented with your profile page. 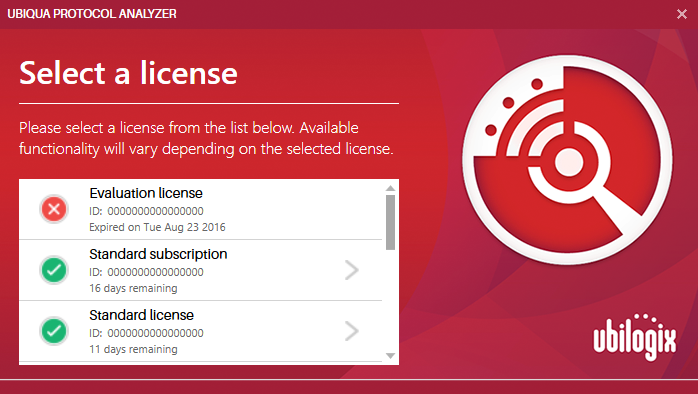 From the Dashboard sub menu click the "Licenses" tab and then the "Redeem activation code" link. A dialog will appear where you can type or paste your activation code, following this action click the "Redeem Code" button. 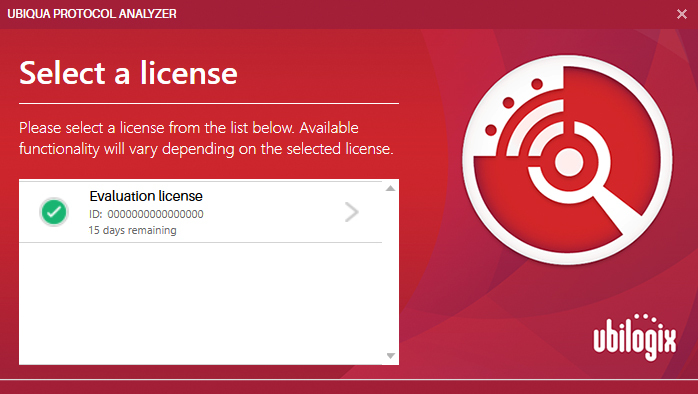 Finally click the "Activate License" button, if the process succeeds your new Ubiqua License will be displayed, and a success message will be shown. 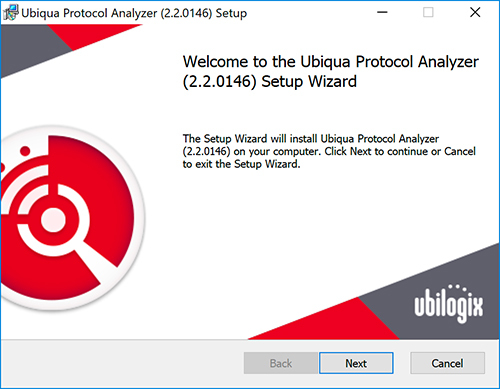 To start Ubiqua either double-click on the Ubiqua Protocol Analyzer shortcut icon on your desktop or click on the Ubiqua Protocol Analyzer shortcut located in the Start > All Programs > Ubilogix group. A Splash screen featuring the Ubiqua logo will appear. The first time you run Ubiqua the Ubiqua Authentication window and the Welcome window will appear. The Ubiqua Authentication window will ask for your Ubilogix account, write the e-mail and password of your Ubilogix account in the respective "E-mail" and "Password" text boxes. If you have an Ubilogix account but you can't remember your password, start the recover password process at: https://www.ubilogix.com/recover. From here you can select the available licenses. If it is the first time you run Ubiqua it may need to connect to the Internet to download additional updated components; this process may take a few moments and then Ubiqua will be ready to run. The Ubiqua user interface is organized in dockable panels. Each panel provides access to different sets of information and tools of the Ubiqua software. This section introduces you to this environment and will guide you through each of the visual components in the application. Further sections of this user guide discuss each component in more detail. The main window of Ubiqua is composed of 3 sections: the menu bar, the workspace, and the status bar. The menu bar, as in other applications, offers you access to the most common options and commands available in the application. The status bar displays the current application status or shows information about the current selected packet. The most complex section is the workspace. As explained above, the many views of Ubiqua are actually dockable panels you can arrange to form the layout of your preference. Each panel has 4 dock modes: floating, dockable, auto hide, and hide. The layout of the workspace is changed by dragging and dropping the individual panels. For instance, while dragging the panel over the workspace, icons will appear over the existing panels giving you the option to put the dragged panel on top, on the right, on the bottom, on the left, or as a tab of the target panel. If you drag the panel out the main window, the mode will change to "floating". To auto hide a panel in dockable mode, just click the button with the pin icon on the top right area of the panel (to the left of the close button). Auto hidden panels will show up when the mouse cursor is over the panel tab (which is located at the far left side of the main window), and will automatically hide when you move the mouse out of the panel. In the above figure, the Watch View is in auto hide mode. To change the mode of an auto hidden panel, you must click the button with the pin icon again (it will show a rotated pin icon). Once you have set the layout to your convenience, Ubiqua will keep the views arranged in the way you specified. You can always reset the layout to the default by using the Window > Reset Window Layout menu item. You have also the option to save the layout on a file and recover it later, to do so use the File > Save Environment… and File > Load Environment… menu items. The environment file does not only contain the layout but all application settings (for details see Setting Preferences). The menu bar offers access to the most common actions in Ubiqua. The following is a brief description of what each menu item does and where you can find more information. Open Capture… – Opens a capture file and loads all the stored data which includes raw packets, security keys, addresses, graph layouts, and others (details in Capture Files). Open Partial Capture – Obtains a consecutive selection of packets of a CUBX capture file. To open partial capture, click on the Open Partial Capture option of the File menu. Select the capture file to open and click the Open button. The Select Capture Packets dialog opens and the user can select a packets range . The date and time are visible when the user hovers over the slider of the selected packet. Save Capture As… – Saves a new capture file with all the present data in the application. Save Filtered Capture… – Saves a new capture file containing all the present data in the application but only the packets available through the currently enabled filter (details in Filtering Packets). Export Packets… – Exports only the packets in the capture; excluding the Security Keys and collected Network Addresses (details in Exporting Packets). Open Environment… – Opens an environment file and loads all application settings such as views layouts, Traffic View column customizations, and others (details in Setting Preferences). Save Environment… – Saves a new environment file and stores all application settings. Recent Captures – Allows you to access the recently opened capture files; the list is limited to the last 32 files. Unexisting files will be dimmed and the "(not found)" text added at the end. To reset the list click the Clear menu item you will find at the end of this submenu. Exit – Closes the application. Change Protocol Stack… – This menu item allows you to change the protocol stack of captured packets by channel and PAN ID combinations (details in Changing Protocol Stacks). Go To Packet… – Selects the packet with the specified ID in the Traffic View (details in Go To Packet). Options… – Shows the options dialog where the application settings are set (see Setting Preferences). Start Device – Starts the currently selected device on the Device Manager. Protocol Stack – Allows you to set the protocol stack used to decode incoming packets from the selected device on the Device Manager (see Configuring Devices for details). Channel – Allows you to set the channel of the selected device on the Device Manager. Add Device… – Opens the dialog used to add a new device in the manager (see Adding Devices). Remove Device – Removes the currently selected device on the Device Manager (see Removing Devices). Traffic View – Shows a view containing a grid with the available packets (see Traffic View). Packet View – Shows a view containing the details of the currently selected packet (see Packet View). Graphic View – Shows a view containing a graphical representation of the available packets. See Graphic View for more details about the functionality of this view. Network Explorer – Shows a view containing a tree of the identified network nodes (see Network Explorer). Device Manager – Shows a view containing a list of devices (see Device Manager). Properties – Shows a view containing the details and options for the current selection (see Configuring Devices and Customizing Nodes for more details). 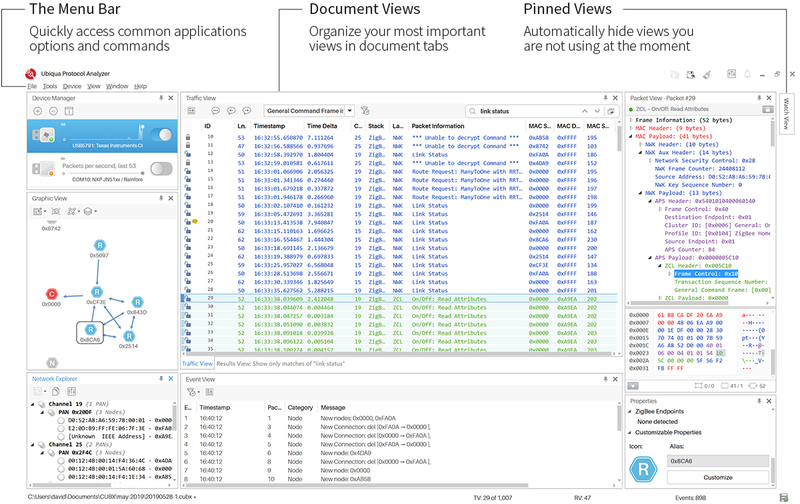 Watch View – Shows a view containing the current values of fields and variables (see Watch View for more details about the functionality of this view). Reset Window Layout – Resets the workspace layout to its default as explained in Docking Panels. Minimize To Tray – Hides the Ubiqua window leaving only an icon in the system taskbar where you can show the window again. This option is useful for capturing packets in background mode or to control Ubiqua by the means of the services it provides (see Ubiqua Services for details). Documentation – Allows you to open documentation website such as this guide. Ubiqua Support Page – Opens the Ubilogix support webpage. Check for Updates… – Checks if a new version of Ubiqua is available for download and opens a dialog showing the latest release notes and if you are eligible for the update according to your license status (see Check for Updates). About Ubiqua – Opens the application about window. When you have a Standard Subscription, Ubiqua PA will present a dialog with the options avaiable before clossing the application. Quit: this option will close Ubiqua PA leaving your user authenticated so you don't have to sign in next time you start the application. Sign out and quit: this option will release your license from the current system and let you login to another computer with the same license.